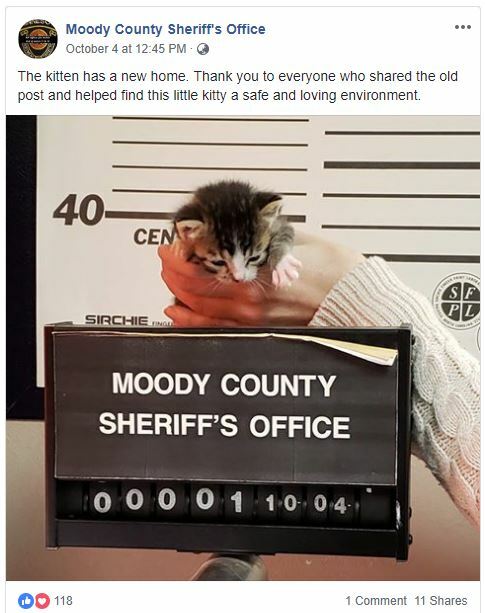 The Moody County Sheriff’s Office decided that posting a mugshot on their Facebook page may do some justice in finding the kitten a new home. Turns out it worked. Weighing in at a mere 10 ounces, the little one was brought into their office one morning. 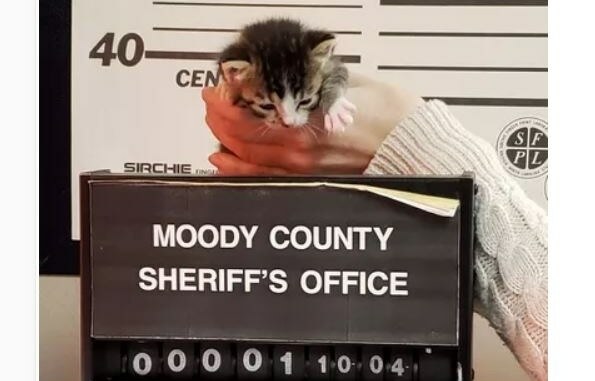 They cataloged their young ward, but were careful to mention to any potential adopters that, to their knowledge, the kitten possessed no criminal record. Unless being too cute for words has become illegal. The kitten was housed with B-Squad Dog Rescue. Mandi Hasse told the Argus Leader they took in the little girl until ready for adoption. Only four weeks old, she was placed with a foster family before becoming available at eight weeks. B-Squad Dog Rescue is 100% volunteer driven. All of our volunteers have full time jobs, we are hockey moms, photographers, dance moms, bankers, students, etc. We all have busy schedules, but find time to do what we can to help make a difference in the lives of others. B-Squad’s motto is you don’t have to be perfect to start making a difference today! We aren’t professionals…we aren’t the A-Squad… we are just ordinary people doing what we can to help make a difference. We are B-Squad Dog Rescue! And they find time to help a kitten, too! 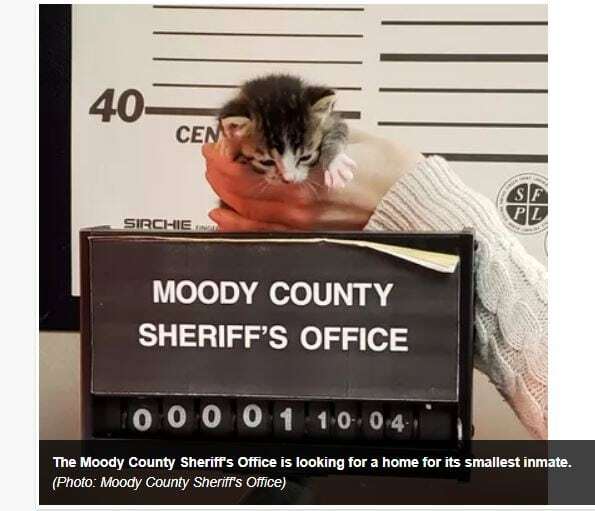 Hasse said B-Squad Dog Rescue felt the only name fitting for the kitten with a mugshot is Felony. Perhaps the best news is that she was just adopted. The Moody County Sheriff’s Office just posted the announcement. Now all this kitten may be accused of is breaking the hearts of all those other hopefuls out there hoping to give her a home. Still this is a great opportunity to remind folks to ADOPT don’t SHOP. There are lots of kittens, cats, and seniors out there ready to steal hearts, no breaking and entering required. Just a forever home.